The joke in the smartphone space in years past was how screens just kept getting bigger — stretching palms and making you look ridiculous when held up to the head to talk. How times change. Talking into phones? Why, how 2005 of you! Phablets have long been the new normal as the telephone icon lost out in the war to capture our attention via finger-flicking touchscreen fun — losing out to all the other apps offering more visual ways to be entertained and/or communicate, be it by text, selfie lens or silly GIF. Apple, a laggard at inflating smartphone screen size, has remained something of a reluctant participant in this ‘bigger is better’ logic. Evident in its tortured sloganizing for its very first phablet, the 5.5-inch iPhone 6 Plus — which it launched in 2014 and stuck next to the words: “bigger than bigger”. The less said about which the better. The iPhone-maker’s reluctance to participate in the pant-stretching smartphone craze has also included an attempt to buck the trend, by reviving — in 2016 — the 4-inch form iPhone factor, and putting a bit more heft under the hood, aka the iPhone SE. It’s continued to range this ‘littlest iPhone’ alongside its 4.7-inch ‘standard’ flagship and 5.5-inch top of the range phablet. But analyst projections suggest declining demand for SE-sized smartphones in the coming years — as phablets are set to take a greater and greater share of the market. tl;dr the phablet is now the smartphone fixture. 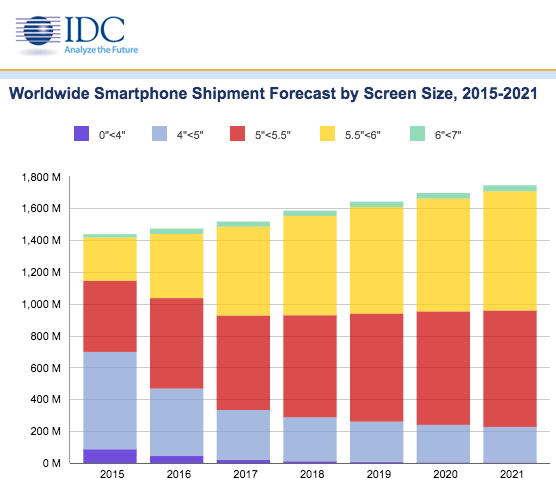 Analyst IDC put out its latest smartphone market projections yesterday, and looking ahead to 2021 it sees shipments of devices with screens of 4-inches (up to less than 5-inches) losing out to those with larger panes. It’s projecting 314.2M million devices in this iPhone SE size category will ship worldwide this year — shrinking to 223.3M by 2021. Meanwhile, it’s expecting the vast bulk of the smartphone market to become almost equally divided between devices with screens of between 5-inches and less than 5.5-inches, and those with screens of 5.5-inches and under 6-inches — expecting shipments to grow from 593.3M and 558.7M this year respectively, to 731.4M and 749.3M by 2021. Which means phablets or phones verging on phablet territory really are the future. Or the ‘phuture’ if you prefer (hattip to my colleague Jon Russell for that quip). As with most inflationary issues, the line between the smartphone and the phablet has shifted over time as phones have swelled in size — so while a phablet used to start around the 5-inch mark (or even a little less), it’s now more typically 5.5-inches+. So it’s possible that by 2021 it may have been pushed out a bit further still. That said, IDC isn’t expecting much market change for the very biggest smartphones (of between 6-inches to under 7-inches). It’s expecting shipments in this whopper category to be 32M this year — and to have grown only slightly to 37.4M by 2021. So perhaps more likely: a smartphone will simply become synonymous with a device that has a screen size of between 5 and 6 inches. And the word ‘phablet’ will end up being reserved for the minority ‘up to seven inches’ proper whopper category. Which just goes to show that winning isn’t always what it’s cracked up to be if you’re a weird-sounding word that nobody liked in the first place. When it comes to smartphone displays, size certainly matters, and the smallest displays (of less than 4 inches look set to disappear entirely). But being the biggest isn’t the best, either — effectively over six inches you have a clumsily large phone and/or a small and therefore not very useful tablet. It’s all about finding the sweet-spot based on device utility: i.e. visual, sensory computing combined with portability. And that smartphone screen size sweet-spot looks firmly settled at between 5 and 6 inches for the foreseeable future. At least until the computing paradigm shifts again — and some kind of socially acceptable wearable manages to lift everyone’s eyes off attention-sucking glass slabs with an augmented vista of the real world instead. At least that’s one theory. Until then, we’d like between five and six inches of touchscreen glass please.